Here I try to interview interesting and successful people who can provide any kind of knowledge, or just have an interesting experience for podcast listeners out there. These are very open and uncut 30-60 minute long conversations, full of short stories, interesting facts and experiences in any business genre. Please support this project, if you enjoy our content. In this episode I interview Patrick Ryan! Patrick is an incredible individual, he works in IT, is an author and a military robotics expert. Patrick has one of the most wealthiest minds in terms of life experience and general knowledge, regarding everyone and everything. This is one of the longest and most interesting conversations we have ever made for KWC Podcast, as Patrick spoke not only about technology, but also about psychology, evolution, literature and religion. Enjoy! In this episode I interview Wim Ouboter! Wim is a Swiss entrepreneur, inventor, former banker, and owner of a company called “Micro-mobility” which specializes in innovative and unconventional means of transportation, for people of all ages. He also invented the popular "Razor" scooter from the 1990's, which we talk about in this Podcast as he shares his ideas of what modern transportation should look like. His company has a new product of very high potential, an electric small car(vehicle) called the "Microlino", which has been modeled from the original 1960's BMW Isetta. Wim gifted us his inspiration, opened up about experiences as a entrepreneur, inventor and marketing expert, and shared some great advice for young entrepreneurs out there. Enjoy! 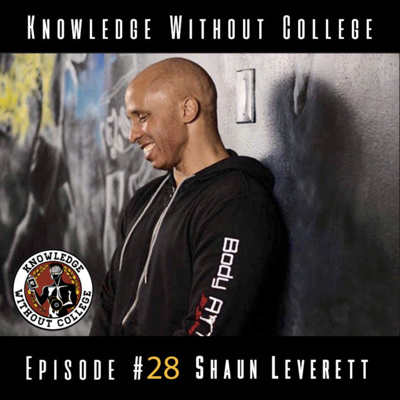 In this episode I interview Shaun Leverett! He is a Certified Personal Trainer, widely recognized for his expertise in functional training, Muay Thai, and his commitment to developing and implementing innovative fitness training sessions. He achieved this, by working in the Fitness Industry for over 25 years, among others as the "Health and Fitness" editor of both "Inglewood Today" and "Crenshaw Today" Magazines. But no, today's episode is not about his career. Shaun has an amazing story to tell, giving us an insight into his rough upbringing, talking about all the experiences he had growing up in his neighborhood, and how he rose above all that. Enjoy! 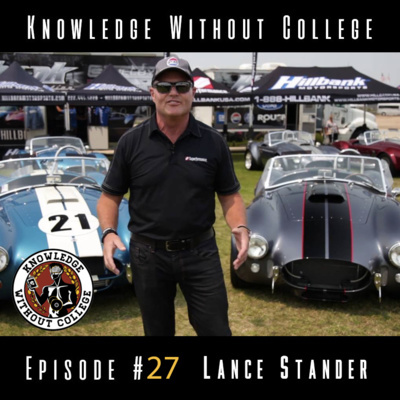 In this episode I interview Lance Stander! Lance has been in the automobile industry for over 37 years. He opened Hillbank Motor Corp located in Costa Mesa, California in 1999 after years in South Africa where he worked with his father. In 2005 Lance purchased Superformance and he is the worldwide distributor for all Superformance built cars. This is an American automotive company which has been designing, building and marketing sports cars, performance components and full car replicas, for the past 20 years. Lance's energy and enthusiasm are amazing, and it doesn't matter if you are a car person or not, he has something in store for everybody. Enjoy! 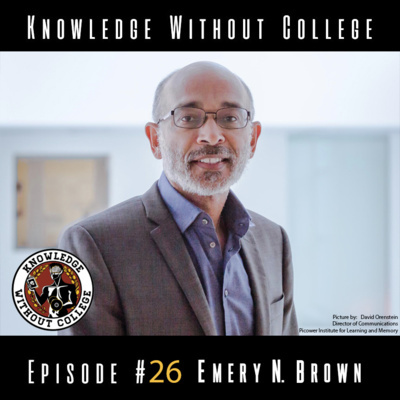 In this episode I interview Dr. Emery N. Brown! Dr. Emery is a statistician, anesthesiologist and neuroscientist. He is the "Warren M. Zapol" Professor of Anesthesia at Harvard Medical School, as well as a practicing anesthesiologist. At MIT he is the "Edward Hood Taplin" Professor of Medical Engineering and Professor of Computational Neuroscience, as well as the Director of the Institute for Medical Engineering and Science, and the Director of the Harvard-MIT Health Sciences and Technology Program. Brown is also the first African American and first anesthesiologist to be elected to all three National Academies. Needless to say that Dr. Emery is one of the smartest individuals we've ever had on our Podcast, and a true hero of our time who works every day to make this world a better place for all of us. It was an honor talking to him about anesthesiology and neuroscience, I recommend you to sit back, take notes and listen carefully. Enjoy! In this episode I interview Joe Quirk! Joe is a very well-known and respected American writer (author), novelist, as well as an Ambassador for the non-profit organisation called the Seasteading Institute. He opens up his mind as we talk about this Project in detail, and his experiences with education in general, and how those helped shape the character he represents today. Joe made this one of the most beautiful KWC conversations we've ever recorded, and we recommend not only listening to his words but also reading them, in his newest book "Seasteading: How Floating Nations Will Restore the Environment, Enrich the Poor, Cure the Sick, and Liberate Humanity from Politicians". Enjoy! P.S. This and other books, can be found on our website under the new page called: Book Club. Check it out! In this episode I interview Mike Spadier! Mike is an expert in marketing, who owns a company called "Heart of the Sun", where he also works at right now. He started his journey while working at Onnit.com with Aubrey Marcus and Joe Rogan as a marketing agent, creator and manager, in two previous occasions. We talk about the process of dropping out of College and taking a gap year, as Mike shares his experience, as well as his previous jobs and interactions with marketing, branding in general and other very useful related ideas. Enjoy! 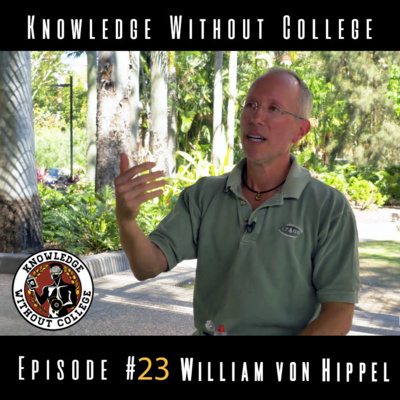 In this episode I interview William von Hippel! William is a scientist and professor at the University of Queensland, Australia. He is a very open-minded, eloquent and educated individual, having received his Doctors degree in Psychology at the University of Michigan. Today, he is an evolutionary psychologist and author of the book "The Social Leap", which I recommend and which we talk about during the Podcast. His work has been featured in "The New York Times", "USA Today", "The Australian" and many other. I had a great time talking about all subjects that peaked my interest from his field of research, in a classic KWC, one hour-long Podcast. Enjoy! 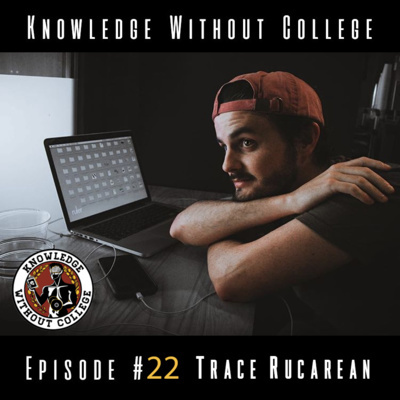 In this episode I interview Trace Rucarean! Trace is another colleague of mine who is employed by Sungrade Solar, and probably has the most fun job in our company (his words). He is very successful, open-minded and a one-man show in terms of everything digital that happens in our company. We had a great time talking about Cryptocurrencies, young people working in the present time, and automation of everything around us, especially job-related. Enjoy! In this episode I interview Vineet Verma! Vineet is a very successful and charismatic person, originally from India but currently working here in California as a screenwriter, producer, editor, 2D and 3D animator. His projects include work with Stella Artois, Glamour Magazine, GQ Magazine, Yahoo, Christian Louboutin, Nine West and he has written and directed the TV Series "Stitch" starring Michael Wright and Harry Lennix. He was very fun to talk to, and has a love for storytelling which he demonstrates during our interview many times. Enjoy! 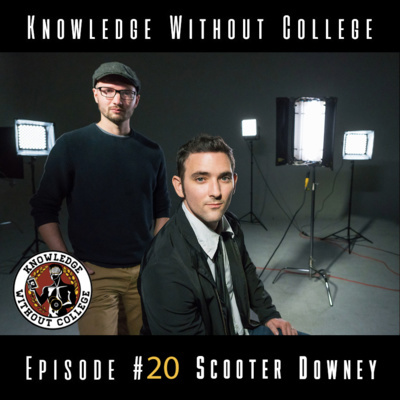 In this episode I interview Scooter Downey! Scooter is a very interesting, young, up-and-coming film director and writer, who is known for his work in "It's in the Blood" (2012), "Elixir" (2015) - writer and "Hoaxed" (2019) - director. "Hoaxed" is a newly released documentary, which he co-directed with Jon du Toit, with the help of famous Mike Cernovich as Producer. It is easily one of the best documentaries I have seen in a really long time, which left a very hard impression after watching. Listen to us talk about the film, religion, and his young career and education, and of course watch it yourself. Enjoy! In this episode I interview Andreas M. Antonopoulos! It was an honor and privilege to do our weekly "open and relaxed" conversation with Andreas, who is a best-selling author, speaker, educator, and one of the world’s foremost Bitcoin and open Blockchain experts. We talk about Bitcoin in particular, it "not dying" and having more and more involvement in our society and life's everyday activities. He is a true professional and a real expert in his field, someone we can all take notes from, delivering one of the longest and most electrifying KWC Podcast dialogues so far. Enjoy! 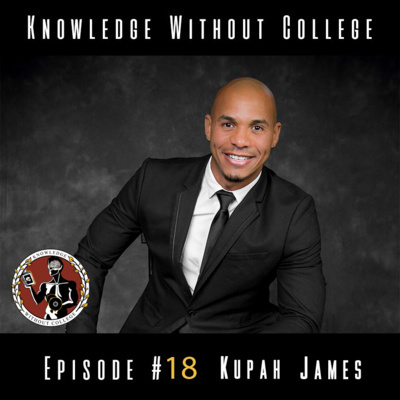 In this episode I interview Kupah James! He is a very talented and successful young individual, working primarily as a Celebrity DJ, with some his previous experiences involving events organised by the New England Patriots, Boston Red Sox, Boston Childrens Museum, AOL, Google, Expedia and even former president Bill Clinton. He also operates as a very well-known Dance/Fitness instructor and model, achieving the same level of success. You had the opportunity to meet Kupah in Season 11 (2015) of The Bachelorette TV show, where he appeared as a contestant. A true source of positive energy, inspiration, and a great person to have a conversation with. Enjoy! In this episode I interview Juan Agustin Marquez! He is a four-time Emmy awarded filmmaker, best known for his documentaries 100,000, The Last Colony and his national music TV show: Té Para Tres con Pili Montilla. Juan's continued commitment to the arts, entertainment and education has earned him a spot as one of today's top Latino filmmakers, and we were very honored to have him on the show. Enjoy! In this episode I interview Seamus McNally! 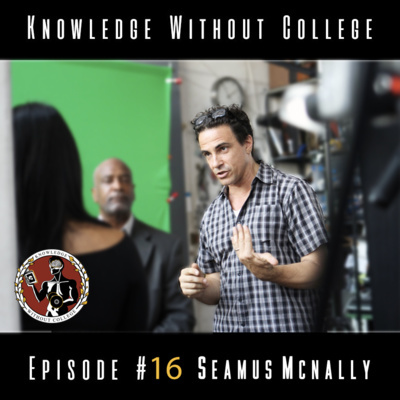 As an award-winning director and acting coach for film and television in New York City, Seamus serves actors at the top of their field in delivering some of their most convincing, nuanced work, often with very little time to prepare (Orange is the New Black, Vinyl, Alex Haley’s Roots and more). He is currently working at another acting school and directing a fascinating documentary about a tragic miscarriage of justice within the Spanish legal system. Enjoy! P.S. The oversea connection gave us a hard time in terms of audio quality, so we're sorry about that. In this episode I interview Mike Schmitz! Mike is a fellow colleague of mine who co-hosts two Podcasts at the moment, one being Bookworm with Joe Buhlig and The Free Agents with David Sparks. He is an author as well, his book "Thou Shalt Hustle" is an excellent example of what content he focuses on as a producer and reader. Definitely one of the best conversations we've had on KWC lately. Enjoy! 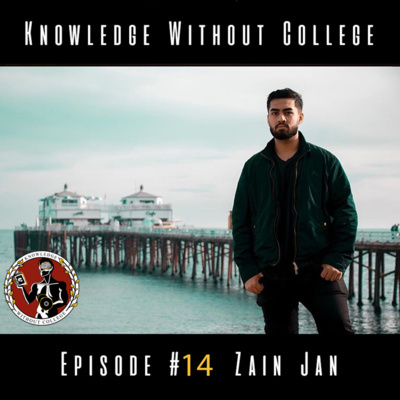 In this episode I interview Zain Jan! First of all, Zain is my friend and one of the first guest speakers to be featured on the KWC Podcast. A lot has happened in the past 12 months since he was on the show. We are focusing on communication in general, and how important it is for the success of everything, and everyone around us. Hope you agree. Enjoy! In this episode I interview Orest Byskosh! 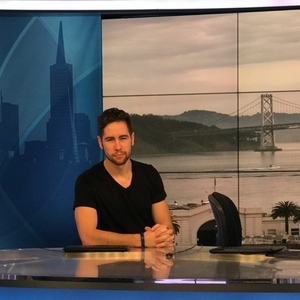 This is a very successful and smart young man who is a college drop-out, but has been working in the Crypto/Blockchain inudstry for the past 5 years, currently being employed by Ausum Ventures. He is going to help you understand the basics of cryptocurrencies and blockchain technologies, talk about his career, and hopefully inspire more of you to follow his path. Enjoy! In this episode I interview Dr. Andy Galpin. Andy has a Masters degree in Human Movement Sciences, and Ph.D. in Human Bioenergetics. A professor of Kinesiology at the Center for Sport Performance at CSU, he is also the founder and director of the Biochemistry and Molecular Exercise Lab. In addition, he is the co-author of UNPLUGGED with Brian Mackenzie and Phil White, and co-hosts the Body of Knowledge podcast. Enjoy! In this episode I interview Nathan Ogden! A very special individual, introduced to us through our mutual friend and former guest Devin Thorpe; Nathan truly represents perseverance. He has a unique life story to share with us, battling through the toughest of injuries and surviving, as a real hero of our time. Enjoy! 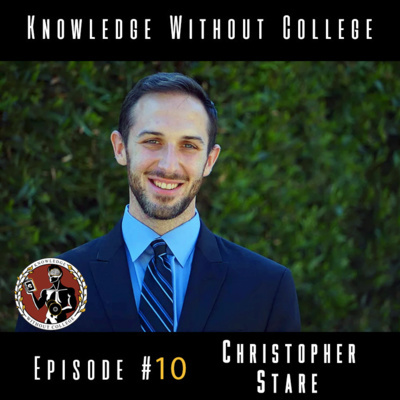 In this episode I interview Christopher Stare! The last one in our series of guests from the Libertarian party, he is a candidate for the California State Assembly representing District 51, running in the General elections on November 6.. He has a PhD in Cognition and Neural Systems from the University of Arizona, and has done research on the biological bases of learning, memory, and sleep. Enjoy! 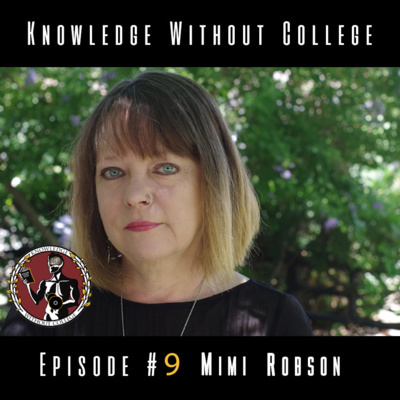 In this episode I interview Honor (Mimi) Robson. She is a Civil Engineer, with the majority of her projects revolving around repairing and reinforcing commercial buildings, that have been damaged by earthquakes, fire, wind and severe weather. She is also the Chairman of the Libertarian Party and was running as a candidate for the 70th District State Assembly. Enjoy! In this episode I interview Devin Thorpe! He really is deeply optimistic, he is an author, educator and speaker, who calls himself a "Champion of Social Good". His experience as an investment banker, CFO, treasurer and mortgage broker earned him a keynote speech at the United Nations. His books on using money for good, personal finance, crowdfunding and corporate social responsibility were read over 1 million times, while his YouTube channel has over 1000 videos. Enjoy! In this episode I interview Zoltan Istvan, who is a Libertarian futurist, journalist, transhumanist and a political activist. He was a reporter and writer for the National Geographic Channel, Wired, Newsweek, The Huffington Post, his writings and ideas have appeared on Yahoo News, The Daily Telegraph, The Daily Beast and other media sites. He was a candidate in the 2018 California gubernatorial elections, and the US Presidential elections of 2016, as a member of the Libertarian Party. A great man, and a great mind. Enjoy! P.S. I recommend reading his book "The Transhumanist Wager". In this episode I interview a very experienced and successful stand up comedian Johnny Beehner. He has made his network television debut as one of the last comedians to appear on the “Late Show“ with David Letterman. He has made numerous appearances on FOX’s “Laughs” television show, on AXS tv’s “Gotham Comedy Live,” and on XM/Sirius Satellite radio. A father of two (soon three), he really is an awesome guy. You will definitely see me at his next show in LA. Enjoy! In this episode I interview Nick Jovicic, a very interesting and successful young man. He has lived on 3 continents, studies machine engineering and has worked in the automotive industry. He has some great start-up ideas and cool engineering facts to share. Enjoy! P.S. We are sorry about the audio issues that we had with this one, hope you still enjoy it and this will be taken care of in the future. 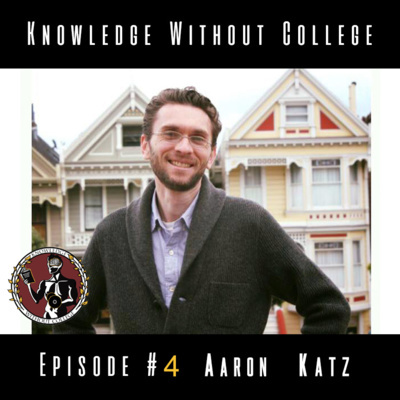 In this episode I interview legendary solar entrepreneur Aaron Katz. Aaron has founded 3 solar companies and is currently the CEO of Sungrade Solar. With 9 years of experience in the turbulent residential solar industry Aaron has unique insight that is valuable for entrepreneurs at any stage of their career. Enjoy! In this episode I interview Zain Jan! Featured in the Huffington Post and Buzzfeed, Zain has achieved remarkable success for his young age. 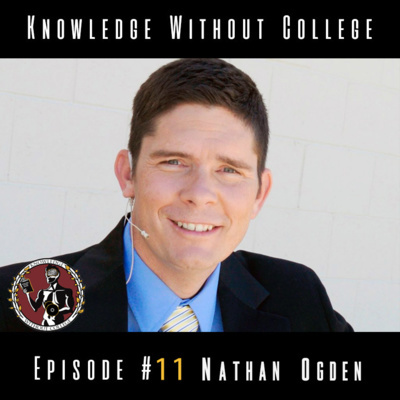 I ask him about his college experience and what it took to get him to where he is today. Enjoy! In this episode I interview a close friend and colleague Andrew Zambetti. He is currently the senior sales manager of Sungrade Solar overseeing the development of 4 sales offices and 65 salespeople around California. I start my professional interviewing career by asking him about his unique college experience. Enjoy! 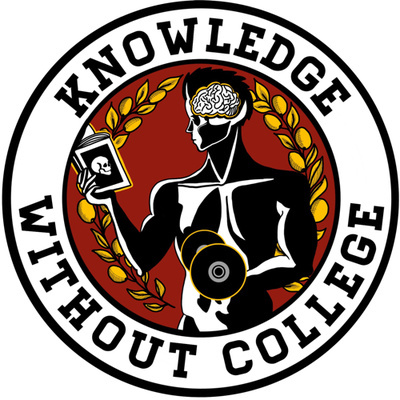 The very first episode on Knowledge Without College! I started back in November and fought the resistance for months to deliver this just for you.